Isobel Barrel Bag. 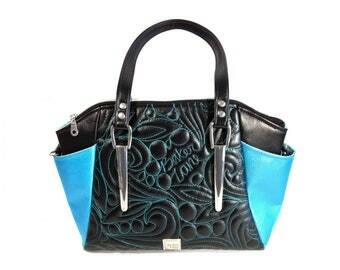 Vegan, marine blue handbag from Amongst the Waves Collection. Unique, colorful quilted purse. Gift for marine biologist. Daphne Handbag. Vegan Quilted faux leather handbag. Unique black purse with freeform quilting and hardware. Small handbag. Kay Clutch with Chain. 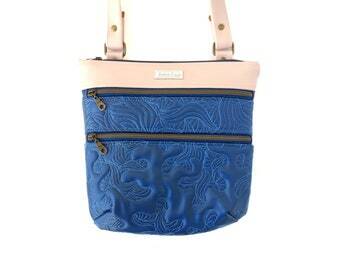 Vegan, living coral handbag from Amongst the Waves Collection. Free motion quilted bag with detachable strap. Eleanor Tote Bag. Vegan quilted faux leather purse. Unique black purse with freehand quilting and edgy hardware for alternative fashion. Announcement Spring Collection: Amongst the Waves Launches March 29th! Spring Collection: Amongst the Waves Launches March 29th! It's A Wrap Sunglass Case with Turtle. Vegan, marine blue bag from Amongst the Waves Collection. Applique glasses holder. Mother's day gift. Kay Clutch with Chain. Vegan, marine blue handbag from Amongst the Waves Collection. Free motion quilted bag with detachable strap. Isobel Barrel Bag. 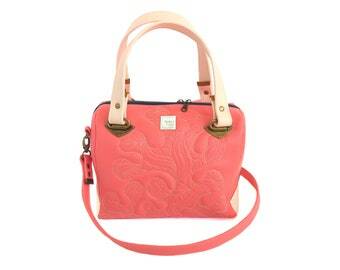 Vegan, coral handbag from Amongst the Waves Collection. Unique, colorful quilted purse. Gift for marine biologist. Collette Shoulder Bag. Vegan, marine blue handbag from Amongst the Waves Collection. Unique, colorful quilted purse with crossbody strap. Lark Convertible Evening Bag. 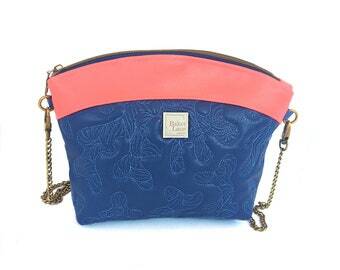 Vegan, living coral handbag from Amongst the Waves Collection. Free motion quilted bag with detachable strap. Collette Shoulder Bag. Vegan, living coral handbag from Amongst the Waves Collection. Unique, colorful quilted purse with crossbody strap. Lark Convertible Evening Bag. Vegan, marine blue handbag from Amongst the Waves Collection. Free motion quilted bag with detachable strap. It's a Wrap Sunglass Case. Vegan Quilted faux leather purse accessory. 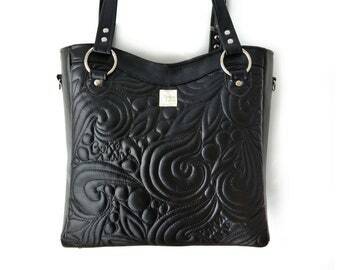 Unique black with freehand quilting and clip for attaching to bags. 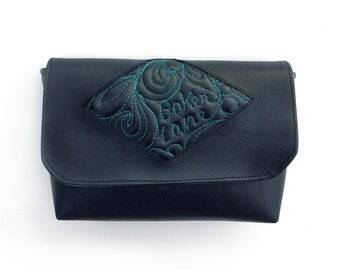 Tulip pouch, quilted faux leather. Vegan, unique black pouch with freehand quilting. Envy Pouch. Vegan quilted faux leather accessory. Unique black purse with freehand quilting, great for bag organization. Marquise Wristlet. 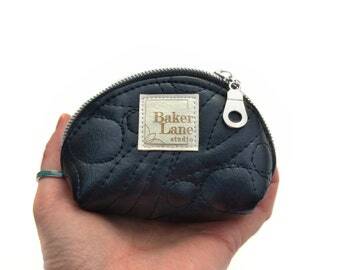 Vegan quilted faux leather wristlet with card slots. 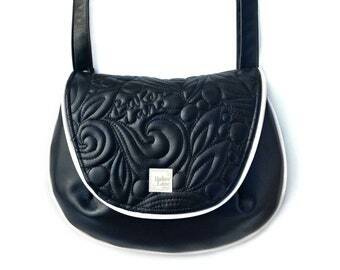 Black purse with free motion quilting for unique fashion. I-spy quilted faux leather pouch. 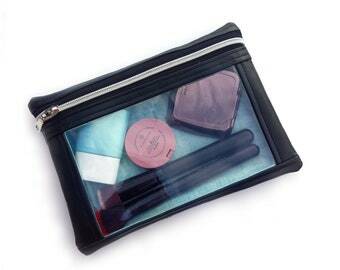 Vegan unique black accessory pouch with freeform quilting and clear vinyl window. 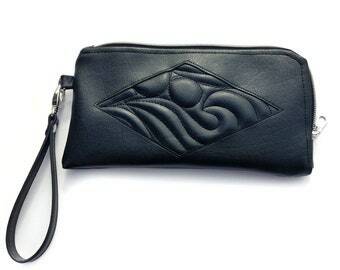 Atlantis pouch. Vegan quilted faux leather purse accessory. 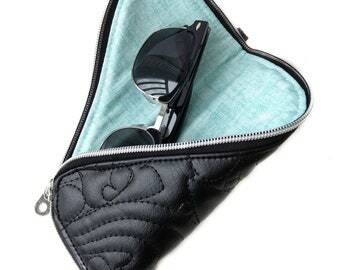 Unique black pouch with quilting fits headphones, lipbalm or hand sanitizer. This bag is beautiful with a timeless design that will compliment any outfit. The hand stitching and free quilting are extraordinary. Katie is helpful at every step of your order and purchase. Even the packaging is pretty and thoughtful. Looking forward to owning more of her unique pieces in the future. FLASH SALE Daphne Handbag. Vegan Quilted faux leather handbag. 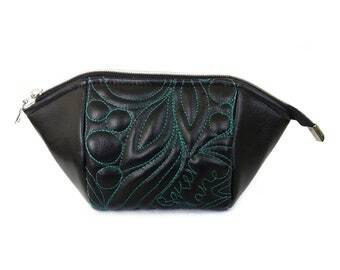 Unique black purse with freeform quilting and hardware. Small handbag. Shipping was extremely fast ordered it friday april 5 and received it mon april 8. Katie's customer service was excellent. She sent me messages to and was super friendly! The packaging when my bag arrived was beautiful and the personal note was a great touch! The bag is even better in person! Highly recommend baker lanestudio! Excellent quality products! Absolutely love my new bag. Amazing craftsmanship and attention to detail, all the way through to the packaging. I will definitely buy from this designer again! I had requested a custom strap for length purposes, and I LOVE how it turned out! The quality of the strap was absolutely top notch and will created. I will be using this bag all summer. Flash sale continues! Save $50 on our most favorited purse! For 3 days only, get $50 off our most popular bag, the Daphne Handbag! This is me in my studio with my sewing machine! I make really texture panels through quilting and then turn them into functional objects-- bags! It's super fun! After 5 years of quilting more traditional materials (aka quilts) on a whim I decided to try a bag making pattern. I'd seen plenty of quilted bags, but they were all grids. I wondered if I could free hand quilt the patterns I'd learned from quilting onto the vinyl I was planning on using to make the bag. I gave it a try and was blown away with how it turned out. I immediately knew I had made something I had never seen before and had always wanted without knowing I was missing it. High-end purses with creative quilting. That was in February 2018. I've spent the time since developing this collection and preparing my business. The Signature Black Collection is my first collection, and has been featured on major news sites such as ABC, FOX, CBS, NBC and the CW. I've been blown away by the response my art has gotten and I am so excited to share it with you. Please don't hesitate to send me a message if you have any questions I can help you with! Every bag is quilted and sewn by me. Each quilting design is hand guided and unique-- no two are exactly alike. No computerization here! For purposes of EU data protection law, I, Katie Baker, am the data controller of your personal information. If you have any questions or concerns, you may contact me at bakerlanestudio@gmail.com. How can I get 20% off my order? I offer steeper discount codes than the ones showing in my shop if you’re interested. You just need to be on my email list and I send them out every now and then to clear out the shop. Here’s the url: www.bit.ly/bakerlanestudio -- I never spam or anything gross like that. That's totally understandable! It can be a big expense and risky to go in blind. Unfortunately, due to the nature of Etsy there's no good way to touch and feel before you purchase. I have worked very, very hard to find materials that are both durable and pleasing to the touch. In the unlikely scenario that you order and are displeased with it, I accept returns for the first 14 days after delivery. I hope that helps ease your conscience! I hear you, it's scary to buy from an unknown source. Who knows what you will get? I personally sew all of these bags myself with the utmost care for their long term integrity. In the unlikely event that any kind of failure (sewing or hardware) occurs in the first year with normal use, I will repair it free of charge. Put your mind at ease.